In today's busy society, contact lenses are the leading choice for many people around the world. Innovations in contact lens design have allowed contact lenses to correct astigmatism, replace bifocal glasses, enhance sports performance, and even change one's eye color. In addition, technological advances in lens material (ie. silicone) have allowed up to 6x more oxygen to the eye to improve lens comfort while reducing dryness and irritation. Do you have astigmatism? No problem! We use the latest toric lens designs which are highly successful at correcting even high amounts of astigmatism. Over 40 and near vision is a problem? No problem! We specialize in fitting multifocal contacts that provide good near and far vision without using reading glasses! 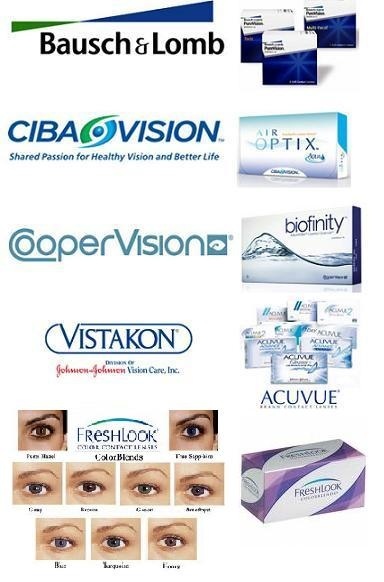 Here at Today's Vision we carry a broad range of contact lenses and related products from all the leading manufacturers to provide you the best available vision quality, comfort, and fit. We stock over 1000 lenses in-office, so you will be sure to leave with your prescription the same day as your eye exam.